The primary purpose of this workshop is to discuss cutting-edge advancements in and envision possibilities for the future of automated functional testing tools. This is a small, peer-driven, invitation-only conference in the tradition of LAWST, AWTA, and the like. The content comes from the participants, and we expect all participants to take an active role. We’re seeking participants who have interest and experience in creating and/or using automated functional testing tools/frameworks on Agile projects. This workshop is sponsored by the Agile Alliance Functional Testing Tools Program. The mission of this program is to advance the state of the art of automated functional testing tools used by Agile teams to automate customer-facing tests. Class Fluid provides dynamically scoped (”fluid”) variables modeled	after those of Common Lisp. It also gives you a convenient way to	reversibly change the values of globals. Fluid variables are useful when you want to pass information among related classes and methods without passing arguments all over the place, but you also want something a little more controlled than globals. They’re not useful all that often, but they come in handy once in a while. Half the functionality of a new feature has been introduced - the other half has not yet been completed. However the developers say this is working software because what was handed over works. But it’s no use to a beta customer site - can’t really show it to a user - can’t really test it as there is no flow. It’s a bit like saying a car ‘works’ when it has no back axle but please test away anyway because the front wheels are fine. Is there a definition of ‘working software’ anywhere? My definition: a feature is working if some person somewhere would be willing to pay more for the software with the feature than she would for the software without it. Another way of putting it: at the end of every iteration, you should be able to sell the software for more money than you could at the beginning. Sounds like your feature isn’t working. As Chet Hendrickson pointed out in the thread, the trick is getting good at breaking Grand Ideas down into bite-sized chunks that can be implemented quickly but still do something useful. That can be hard to learn, but I’ve been impressed when I see it done well—impressed enough that I’ve come to the working assumption that it’s always possible. If you can’t see how to do it, that just means you don’t have enough experience and haven’t learned enough tricks of the trade. If stories are split architecturally (horizontally), then the “working software” is quite like what you describe. If stories are sliced vertically (i.e., it does work end-to-end, but only for a few scenarios), then it is more useful for testing, feedback, and validating the architecture. Vertical slicing is what is recommended, but developers tend to think in components, so it is much easier for them to split stories into one for each component instead of figuring out which scenario (sometimes, a trivial one) they could actually do end-to-end through all the components within a single iteration. In my experience, defining small stories is one of the toughest things for the product director to learn. Building an architecturally coherent system in small slices is one of the toughest things for programmers to learn. As Jeff Patton has pointed out, there are dangers to small slices: it can be tricky to make everything hang together into a coherent, usable system. (See his span planning, for example.) Perhaps incorrectly, I emphasize getting good enough to be dangerous. 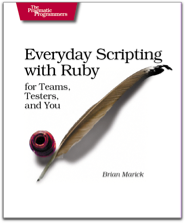 Everyday Scripting with Ruby comes with a library, anachronistically called s4t-utils. It’s mainly used behind the scenes to simplify working with scripts, but it also has a pile of utilities I use frequently. However, if you’re making gems anyway (like I’m doing these days), s4t-utils might as well be another gem your gem depends on. So s4t-utils is now available from Rubyforge and thus via gem install --remote s4t-utils. This version has a few small additions. It also has documentation of the general-purpose utilities. For any number of purposes (exploratory testing, writing bug reports, getting examples for user’s manuals), I would like the following plugin to Quicksilver. It would be somewhat similar to the iGTD plugin. Invoke Quicksilver with its keystroke. Type ‘.’ to start writing a note. Write the note, strike one or a few keys to send it to the notetaker. The notetaker appends it to the open document. I’m going to start copying my replies to questions on agile-testing here. 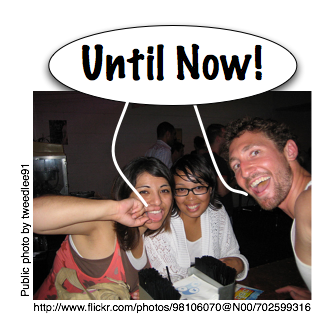 External/Dependant requirements—for example will real users be involved in UAT/Usability Testing? When will they be involved? (If it is “general” public this needs time to organise, if they are in another country/offsite do you want someone to be there to monitor/oversee what they are doing). Is a usability lab going to be used? Does the product need to be benchmarked by an external company? When? etc. Software/Tools—if anything needs to be purchased this should be highlighted. I am at best an amateur facilitator so this will be a handy checklist / self-retrospective-list for me. My biggest problem is dealing with what Sam Kaner calls “the groan zone“—the place where progress seems stalled and the group can either move through it or (more likely) fall back. At that moment, a whole bunch of people and ideas are in unstable equilibrium. What I’m not so good at is keeping the strongest personality in the group from tipping the equilibrium to a solution that meshes best with their personality. (Sometimes I’m that person.) Since, as Mencken said, “There is always an easy solution to every human problem—neat, plausible, and wrong,” it’s important to hold the balance. That’s why I’m most comfortable with situations where we can agree to stop for now, go off and do an experiment that makes us know more. That’s not always possible—and, whenever it is, it requires convincing people to stay in the groan zone indefinitely. Contrary to - well - pretty much the entire software industry, I don’t believe that a software architect is someone who designs software. I believe that a software architect is someone who recognises a good software design when he sees one. But, self-doubting liberal that I am, I can’t only conclude that unsigned Wall Street Journal editorials are written by people whose preferences and loyalties have made them—to use the precise academic terminology—bullshitters, people to whom the truth is completely irrelevant. I have to wonder to what degree I do the same thing, to what degree my own comfort and self-interest has led me to push back against the whole post-Agile thing, despite my respect for Jonathan Kohl and Jason Gorman. Fortunately, I have morphing software to play with, so I can cut self-reflection short. John visits the home page. John follows the “sign up” link. John signs up as “john”, email “john@example.com”, password “sloop”. 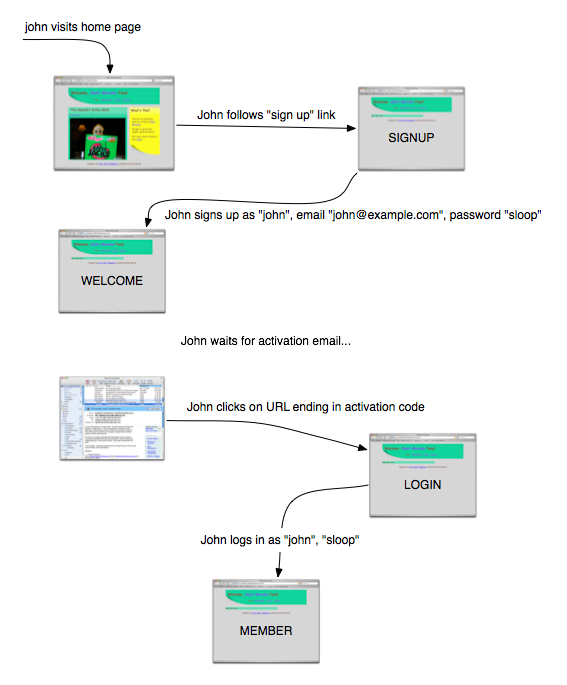 John clicks on a URL ending in an activation code. John logs in as “john”, password “sloop”. Which is better? If I were trying to design the workflow—get it so that it’s right for the users—I’d much rather use a picture (whether drawn in OmniGraffle, as this was, or on a napkin or whiteboard.) Why? It’s easier to “zoom out” from a picture, to ignore the details. When I do that, I’m more likely to notice missing workflows or stupidities in the ones that I have. As a designer, I’ll soon have to explain my thinking to others. It’s easier to explain a picture because it’s sitting right there in front of both of you, visible in two-dimensional space. It’s simple to refer to something you already mentioned: point at it. A wealth of context gets recalled by that simple gesture. If it’s not readily recalled, you can decorate the graphic with something that jogs the memory. Pictures make for a much more fluid way of communicating. Our minds are in bodies; and bodies have minds of their own. We think kinesthetically and visually, not (just) by banging propositions together according to the rules of some kind of logic. The more ways you think about something, the fewer mistakes you’ll make. But there’s one big disadvantage of pictures from the point of view of the test-driven (behavior-driven, example-driven) programmer: they’re not executable. I’ve released an alpha version of an open-source library that converts such pictures into Ruby tests. Below the fold, I show how the workflow picture becomes a Rails integration test.